If you’ve got a Jeep Wrangler Unlimited sitting in your driveway yearning for mods, here’s some inspiration: The Jeep Trailstorm Concept. It’s not particularly exciting, but it’s definitely still a beast off-road. 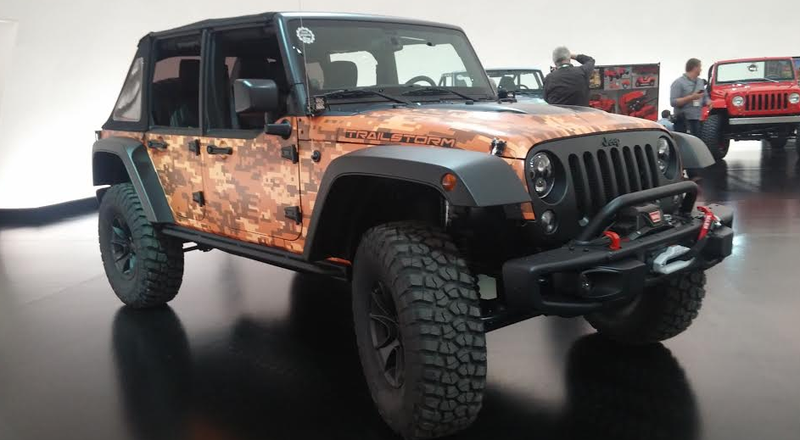 This morning, Jeep invited me to their headquarters in Auburn Hills and showed me a bunch of Concepts cars, which they’ll display at this year’s Easter Jeep Safari event in Moab, Utah. Among the more “tame” concepts was this, the Trailstorm. This isn’t so much a concept car as it is a display of the JK’s incredibly vast choice of bolt-on accessories (particularly those from the Mopar brand). You could build this thing in your garage with a basic toolset, which is great, because this thing’s probably a beast off-road. Okay, let’s get to the point: this Jeep’s sitting on 37s. Yes, those are awesome. What’s even more awesome is that those giant tires fit under the JK despite a modest two-inch lift. Of course, for that to work, Jeep’s bolted on some high-top fenders, which sit farther up on the quarter panels, meaning you can clear big, meaty tires without rubbing during full bump and lock. There’s also a winch, Rubicon Dana 44 axles, Fox shocks, a bedlined interior, unique rock rails and a big brake kit—all great off-road hardware that you could apply yourself to your neglected stock JK. Still, Fox shocks and 37s? I approve.